Russia is developing cutting-edge methods of nuclear safety and waste disposal in Murmansk. In early July, the Kola Peninsula in the northwest part of Russia – where the nuclear icebreaker fleet base of the RF and the first Russian nuclear power plant built beyond the Arctic Circle operates – is covered in green; and the sun barely sets during the night hours but snow still lies on the mountains and high hills. This is the sublime picture of this region seen by representatives of the International Atomic Energy Agency (IAEA), the global nuclear watchdog, when visiting facilities of Rosatom in the Murmansk region. They came from 15 countries. Ambassador Rajiva Misra, Permanent Representative to UNOV (Vienna) and UNIDO/Resident Representative to IAEA, represented India. Representatives from Algeria, Vietnam, Egypt, China, Kuwait, Pakistan, Saudi Arabia, Turkey, Japan, and other countries were also part of the delegation. The IAEA Deputy Director General Alexandr Bychkov noted that it is already the second time that official representatives and experts from the countries that work on a permanent basis at the IAEA headquarters in Vienna have visited, at Rosatom’s invitation, nuclear facilities in the RF. The first such visit occurred last year at the Kalin NPP, said Vladimir Kuchinov, the advisor on international issues to the Director General of Rosatom. But this time it was decided to demonstrate that Atoms for Peace and Russian nuclear technology are working safely and effectively in the challenging conditions of the far north. The Murmansk region faces the serious issue of the safe storage and utilisation of radioactive waste. SevRAO specialists are consequently liquidating the remains of active nuclear activities with the participation of foreign partners. And this activity, judging by the questions and reactions of the IAEA representatives, earned their high approval. The Kola Nuclear Power Plant is located 125 miles south of Murmansk on the shores of Lake Imandra. It produces approximately 60 percent of the energy in the Murmansk Region. Three power generating units with VVER reactors are currently in use; each one has a capacity of 440 MW. The guests toured the new waterfront facility in Saida Bay, where ob- solete reactors and decommissioned nuclear submarines are placed in controlled stored for long – up to 100 years – periods. Since this specific activity was transferred from the Navy to Rosatom, and particularly her subsidiary company SevRAO’s control, large-scale rehabilitation works have been conducted and modern infrastructure for executing complex operations has been created. Valeriy Panteleev, the head of SevRAO, told the touring guests that such a result was possible largely due to the financing and technical assistance of Germany. At the Kola NPP, the first NPP beyond the Arctic Circle, the IAEA delegation visited the reactor and machinery divisions and appraised the work of the staff on duty in the control room. The Kola NPP know-how is a special complex of the processing of liquid radioactive waste (LRW) which was developed and launched here on an industrial scale in 2006. The director of the station, Vasily Omelchuk, said that this method holds serious promise for other nuclear power plants in Russia and abroad. The IAEA representatives saw an “echo of Fukushima” in actions at the NPP. 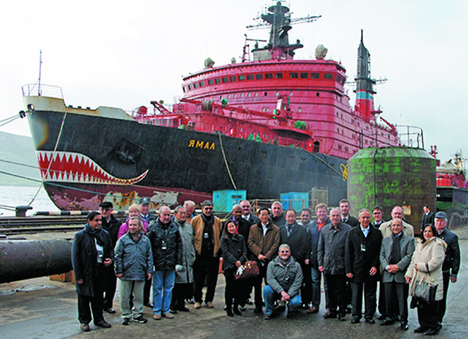 The team also visited the currently active nuclear icebreaker “Yamal.” In the near future, said the Director General of the company Rosatomflot, Vyacheslav Rushka, the volume of work for Arctic “vezdek- hodovy” (“go-everywheres”), as the nuclear icebreakers are called, will sharply increase. The increase of the volume of freight transport from the current 1.5 to 17-18 million tonnes is tied first and foremost to the large-scale production of LNG on the Yamal Peninsula. The second priority for Atomflot, emphasised Rusha, was and will be the development of international transit shipping on the Northern Sea Route through close and mutually beneficial cooperation with ship owners and shipping companies in Europe and Southeast Asia. To guarantee year-round navigation in the Arctic, Russia has begun the construction of new generation nuclear icebreakers. The first of three ships of this series has been under construction since 2013 at the Baltic Factory in Saint Petersburg. Russia owns the most powerful icebreaker fleet in the world and has unique experience in the design, construction, and exploitation of such ships. The active nuclear icebreaker fleet currently has 5 nuclear icebreakers, 1 LASH carrier, and 4 technical service vessels. Their task is to ensure the stable functioning of the Northern Sea Route as well as access to areas of the Far North and the Arctic Shelf. The fleet developed alongside national nuclear energy. The decision to build the first nuclear icebreaker fleet was made on 20 November 1953, but its construction began on August 24, 1956 on the building berth of the Admiralty Factory in Leningrad. On December 5, 1959 the icebreaker Lenin was launched. And in 1989 it was decommissioned and placed in “eternal park” in Murmansk. There is now a museum on the icebreaker.